Saturday morning 10:00 in Karlsruhe, Germany. Last event of XP-Days 2009: community day with a very well moderated World Café. All input for this posting was created in a 20 minutes timebox with four random conference attendees including myself as host of the table. We came to the conclusion that the break-down process from product vision to detailed, small user stories may require not only business and domain know-how but also some amount of technical understanding. In theory this should not be the case but experience shows that on a very detailed level of user stories it may happen that technical issues need to be discussed: the smaller the story, the more technical it gets. Theorem: The technical scope of a user story is reciprocal to its business scope. For best collaboration it is obviously required to maximize both the Product Owner’s technical skills and the Team’s business know-how. The more both parties understand of each other’s field, the better does the break-down process work to get small user stories. Following image was drawn on our World Café table to illustrate the theory. The image shows an ideal situation. Both the Product Owner and the Team have very high skills and know-how so that maximum collaboration is possible. All the way of breaking down the product vision into small user stories can be a collaborative effort with best results. The Product Owner’s position with her strong business expertise. The intersection of the Product Owner’s level of technical understanding and the break-down transition. 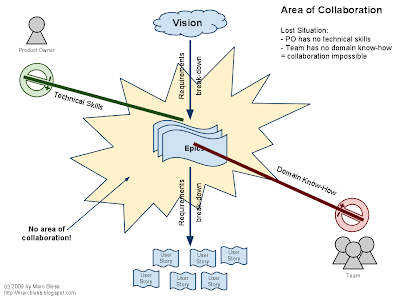 This is the point within the break-down process up to which the Product Owner is able to collaborate. The Team’s position with its strong technical expertise. 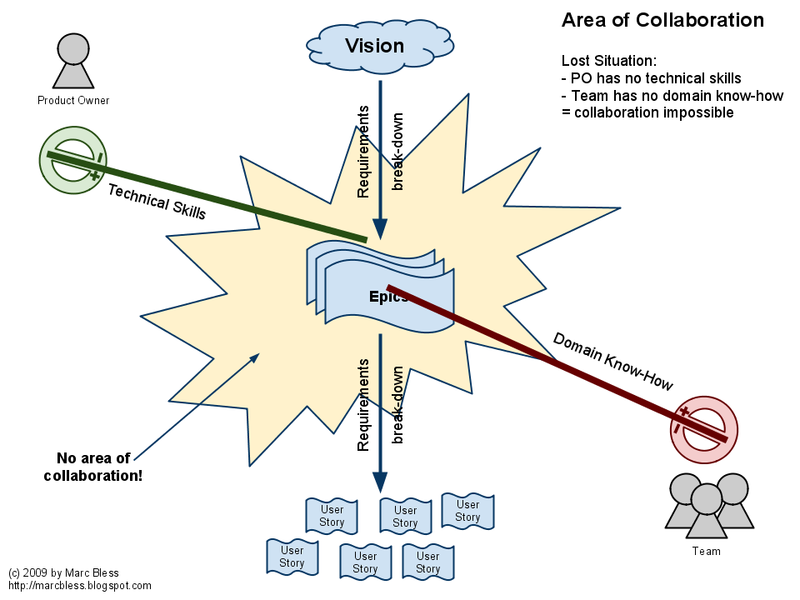 The intersection of the Team’s level of domain and business know-how and the break-down transition. 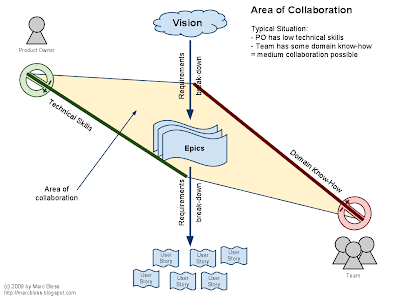 This is the point within the break-down process from which on the Team is able to collaborate. 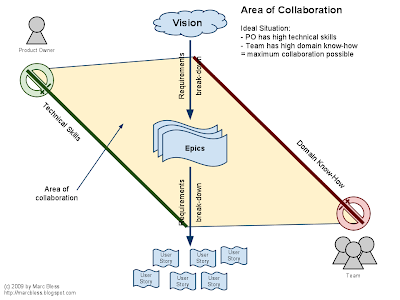 Following image illustrates the Area of Collaboration for an ideal situation. In such an ideal world the team can be fully involved right after the first vision of the product is born. This is the wanted condition of understanding and collaboration! The less know-how either party has of the opposite field of expertise, the smaller is the area of collaboration. In typical project organizations the know-how is restricted to a low or medium level. This leads to split-up efforts: first a lonely Product Owner breaks down her vision into epic stories forming the big picture of the product. Then some collaboration of Product Owner and Team breaks down into smaller stories and this is the part to brief the Team so that it gets a broad understanding of the business values. In the third step the Team must break down into most detailed stories on its own, as the Product Owner does no longer fully understand the technical issues to be discussed. This is the dangerous part which can lead to misunderstanding and wrong product decisions. But things can be even worse. 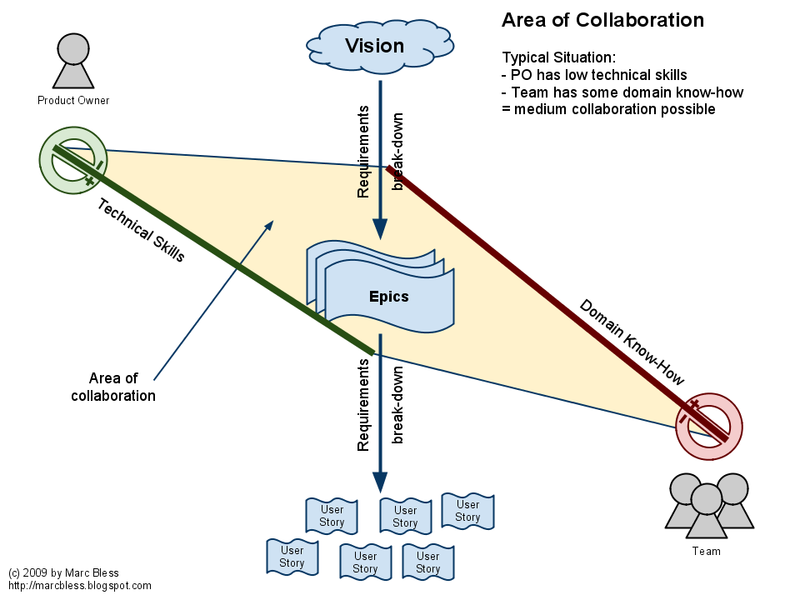 Image a Product Owner and a Team who both do not have any common know-how and understanding. 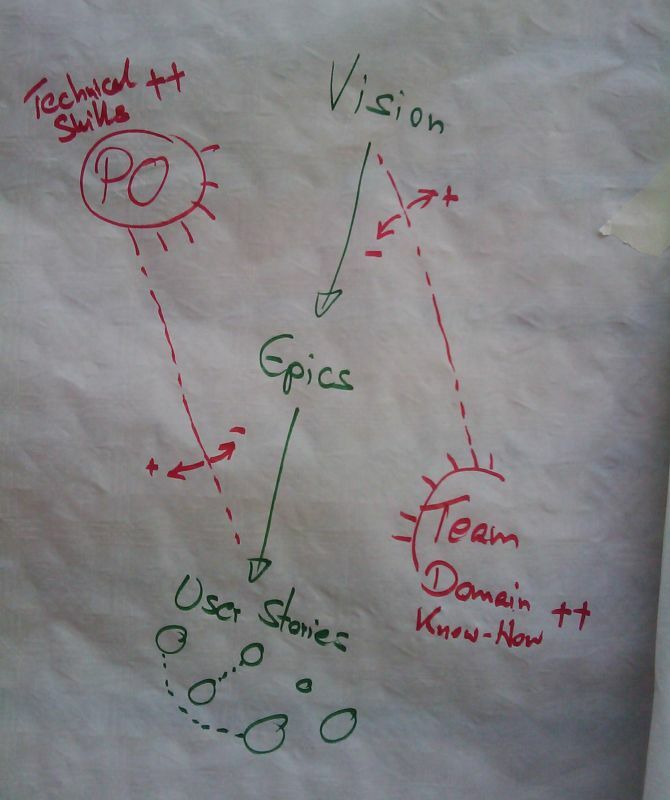 The Product Owner breaks down her vision into stories without any involvement of the Team. Then the Team takes over and breaks down into detailed stories without any collaboration with the Product Owner. That kind of approach has great chance to get lost. The Product Owner needs at least as much technical skills to understand the Team’s break-down into detailed user stories. 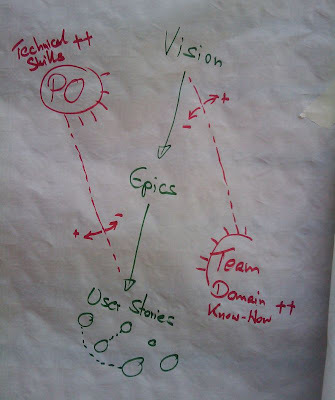 The Team’s domain and business know-how is even more important than the Product Owner’s technical skills! If the Product Owner lacks technical understanding the Team has to compensate with domain know-how. 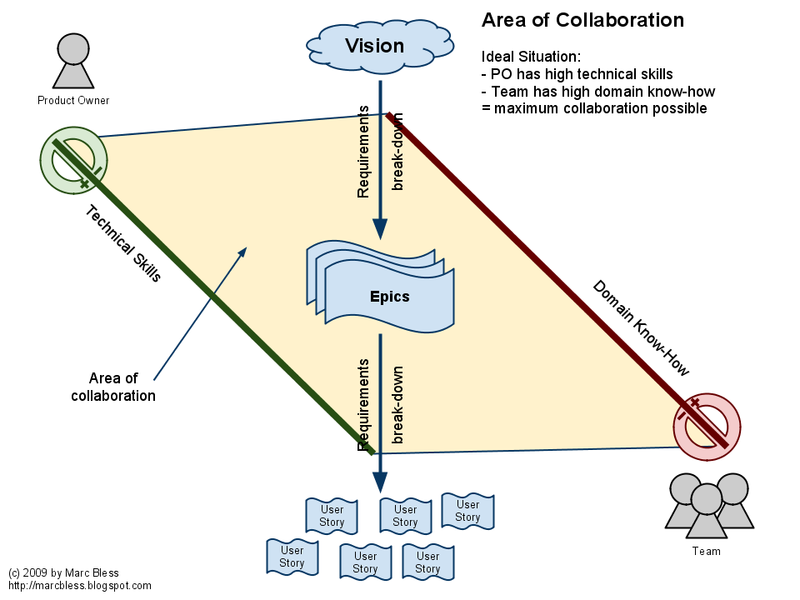 A goal for every agile team should be to reach the ideal, maximum area of collaboration. As agile coach, mentor, or Scrum Master you should determine the respective know-how and skills of Product Owner and the Team. Handle low values as impediments instantly and increase the area of collaboration. Final rule: Make the Product Owner and the Team work together from the very start of the project!